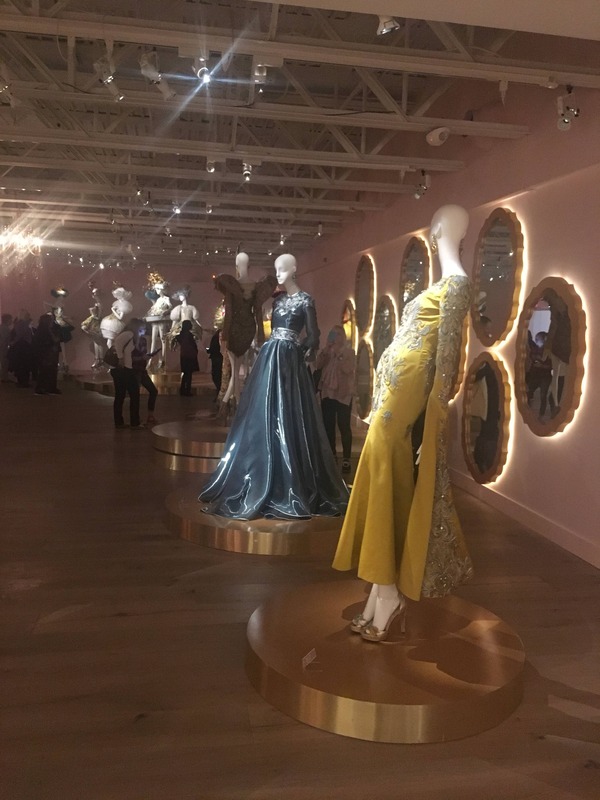 Last year, I had the pleasure of going to the exhibit of Guo Pei's amazingly detailed work at the SCAD Fashion Museum exhibit in Atlanta (where I went to grad school for Arts Administration!). I wanted to talk about that visit and how it brought to life the inspiration I've tapped for my Birthstone Goddesses series. 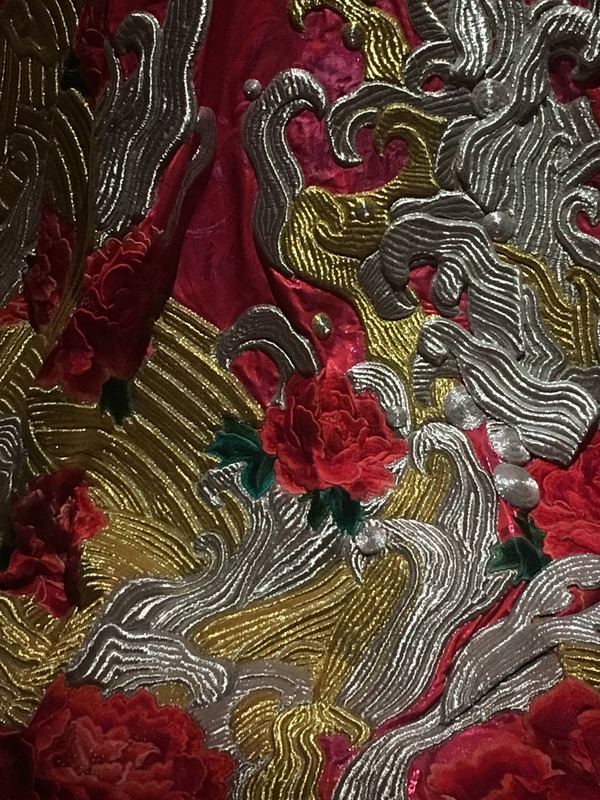 Guo Pei grew up in China and began sewing at a young age. Her gifts went unappreciated, however, as she was creating nonstandard fashions during a point at which Communist laws highly dictated what could be worn. 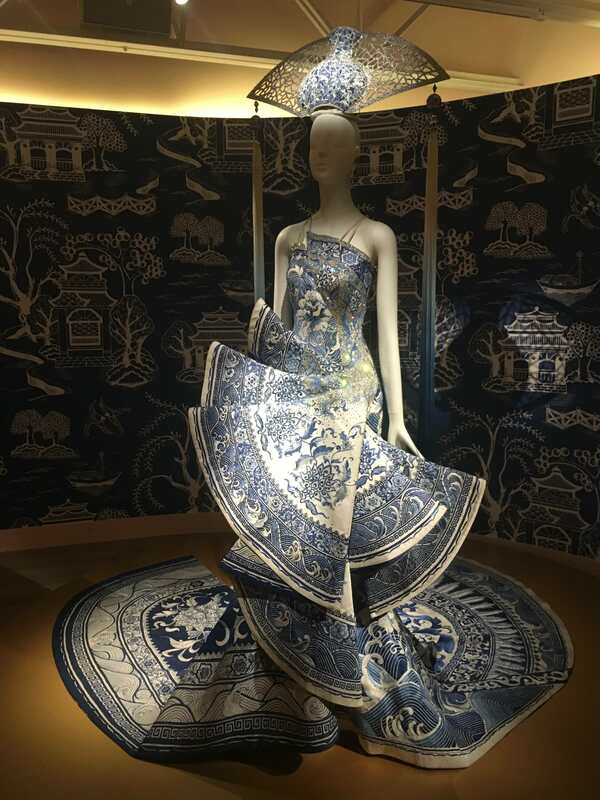 This didn't smother her imagination, though, as she went to the Beijing Second Light Industry School for a degree in fashion and continued to explore her creativity, drawing inspiration from fairy tales, fantasy, and traditional Chinese designs. Seeing her creations in real life was awe-inspiring! 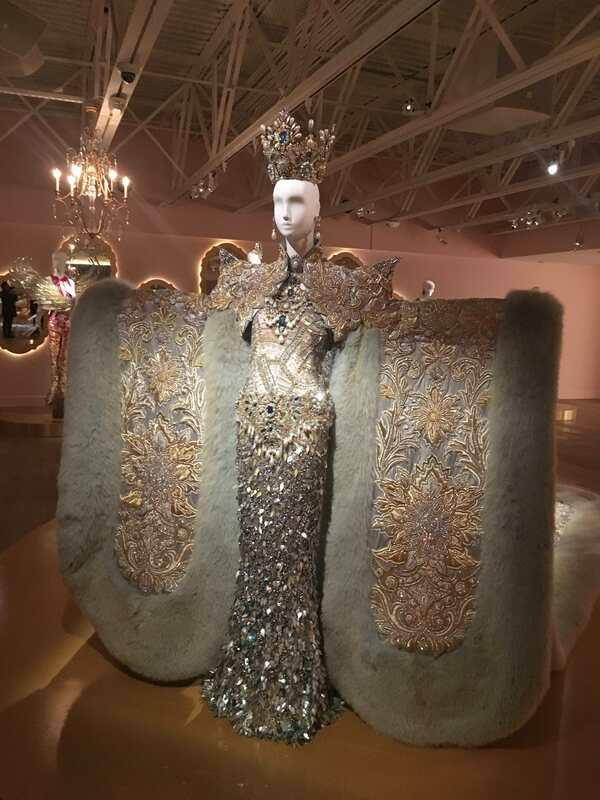 It's one thing to look at photos online and pin them on Pinterest (where I spend a lot of time studying haute couture), but entirely another to be immersed in the gleam of cloth-of-gold, countless embroidered crystals, and elaborate textures. The entryway to the museum is also a sight to behold with its bright colors and hanging crystals! 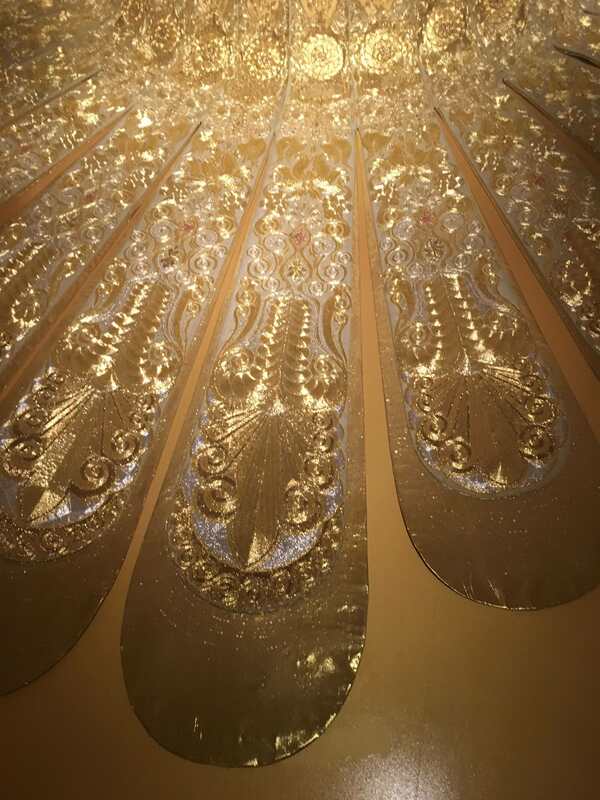 It's a gleaming portal that invites you into another world, one lined by mirrors that lead you into Guo Pei's waking dreamscape. 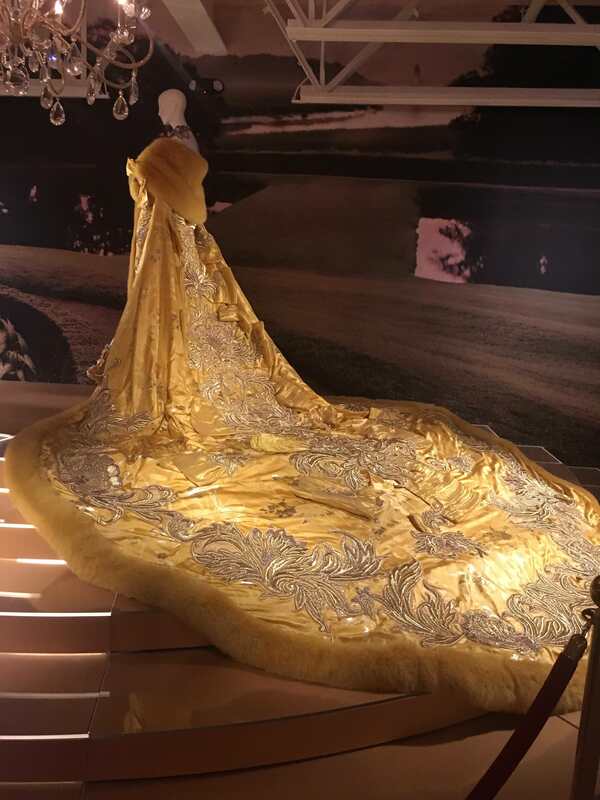 Guo Pei's dresses conjured dreams with fractal structures worked into dresses and layers of sheer cloth paired with glittering trim. 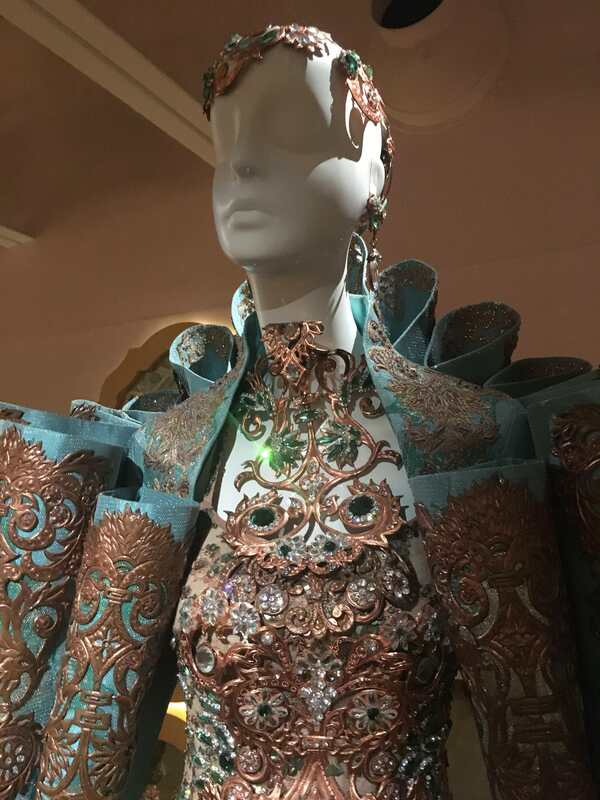 Like my Birthstone Goddesses, her fashions conjure the texture of what can be produced by hand, but push beyond that border into dreamlike surreality, mortal and divine all at once! What better fashions to dress Goddesses in? This is a philosophy I've also kept in mind while drawing my series, though I probably didn't reach the heights of detail I wish I could have gotten with my Birthstone Goddesses! (Fun Fact: I consider drawing fashions one of my weaknesses and took on this series to help improve my skills, among other reasons). 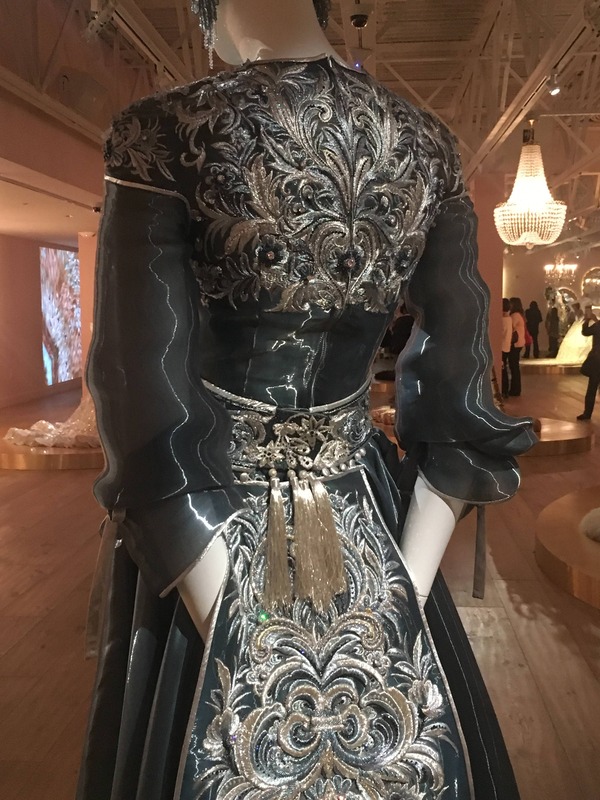 I don't want to simply copy real-world fashion, but push beyond that border into something unique, imaginative, and reflective of each Lady's aspect. I took so many photos at this exhibit that I filled up my camera and ran down my battery AND then did the same to my mother's camera! Aside from being a feast for the imagination, this exhibit was also a treasure trove of reference photos for different textures. You can view an album of all the photos I took at the exhibit here. If you ever see this exhibit come to a town near you and you have any interest in fashion and artistry, I highly recommend attending! For now, it will remain one of my most vivid and awe-inspiring museum experiences.